Keith and Paddy claim the fame factor. Reuters gives Hadar a mention. Following in the tourists steps. There and back to see how far it is. Heading for the Tring Canal Festival. Keith and I have enjoyed a fantastic time at the Wendover Canal Festival. The weather certainly brought the public out. We got to meet up with many friends and made some lovely new friends as well. Unfortunately because we have a very poor signal here in Bulbourne, I have been unable to post photographs or blog since getting to Bulbourne. Which has made us come to a decision about blogging over the summer. We have decided to take a summer break from the blog. We have been blogging now for 5 years and feel a break is needed. 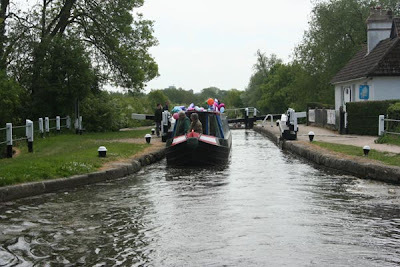 We are going cruising with friends Elaine and David on NB Patience to Stratford-upon-Avon and want it to be blog free. We are not giving up on the blog completely, we just feel that we need some time out. We both wish you a wonderful summer no matter where you are and we will post again when we feel the urge. Thank you to all of those people who read our blog and post messages, please do not abandon us as we will be back. P.S. Keith took part in the RYA/IWA Helmsman's Certificate yesterday and passed along with the other 3 boatman taking the course. They have had to take this as all commercial craft have to be operated or under supervision by someone who is qualified to operate the boat. Even the examiner felt it was ridiculous as, in his own words, he reckoned Keith could teach him more about boating and canals, but such is life and red tape! Kings Langley to Dudswell, 7.8 miles and 22 locks. This is just a short posting because we are both shattered after an eventful days cruising. The weather was absolutely glorious all day. It was a shame that the people we met up with on our travels were not the same. On saying that one gentleman we shared a few locks with was a real diamond. Dennis on NB Narrow Escape, proudly told me that he is in his 80th year and has only been boating for 15 months. He reckoned that life was to short to be sat around getting old, so he took to the canals to see this beautiful country of ours before his time is up. We shared lots of laughs as well as a few moans, as he asked me "What has happened to being polite?". My answer to that was "I was hoping you could tell me", which had us both laughing. We left Dennis and his collie Shadow above the Winkwell Locks, where he produced a bag of doughnuts from his galley and offered us both one, which was really sweet of him. he can share locks with us anytime, It has been ages since we had doughnuts. I wish there were more like him around. Hopefully we will see him again at the Wendover Arm Festival over this coming weekend. Our day has ended in between the Dudswell locks, leaving us just 2 locks to the summit. After what we have experienced today, it is making us both think of going back to 6am starts and finishing at between 9 and 10am, so that we miss the individuals who seem to think the canal is just for them or those people who want to use it as a race track. On at least three occasions today we could have got confrontational with people, but decided what was the point. On that note I am off to enjoy a nice dinner and a cup of coffee. Rickmansworth to Langley Wides, near Kings Langley. 7.3 miles and 13 locks. With the Rickmansworth Festival over with for another year and all the boats gone, it was time for us to leave this morning. We had stayed on for a couple of extra days, as we met up with Keith's sister and brother-in-law for a meal last night at Tang's Chinese Buffet, which was really yummy. We heard Frank and Sue leave at 8am on NB Lotus and decided we really should get out of bed. Before we could do anything, Paddy had to have his walk and as we left the boat, I was greeted by a Heron no more than eight feet away from me and the boat. 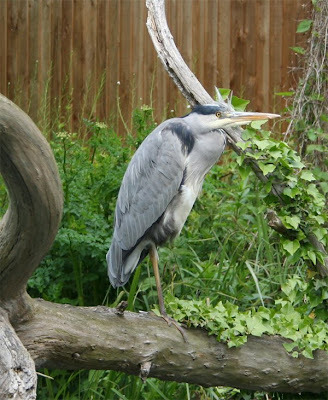 It sat on the branch like a grumpy old man. But it certainly did not mind me taking its photograph. With breakfast done, we slipped our mooring at 9.15 am and entered Batchworth Lock, whilst in the lock, Keith emptied the toilet cassette and I got rid of the rubbish we had collected over the weekend. 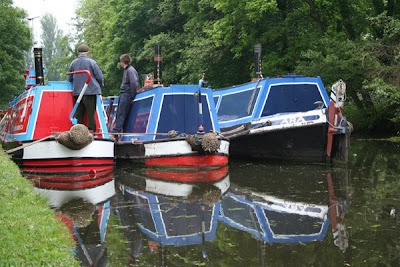 We crept slowly past the moored boats on the Permit Holder moorings. When ever we pass this boat it always makes us smile. 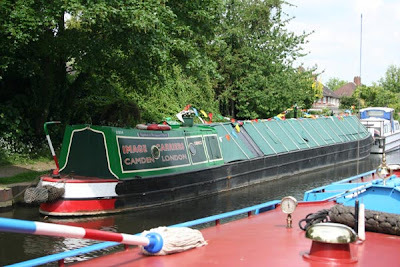 NB Crinck Cronk is one of the more interesting boats on this section of the Grand Union. Clearly who ever designed this boat, put a lot of work into it, as it really looks the part. What does not however look the part is its well out of date licence of 08/08 for both the standard licence and the mooring licence. Now it may just be that they have the new licence on the towpath side and have left the old ones on the water side to annoy eagle eyed boaters like me, but if that is the case then they are not the only ones. Because this section of the Grand Union is fast becoming a tick-over area only when cruising, because of all the moored up boats with out of date licences or even no licence at all. It was not until we reached Cassiobury Park that we had some clear water. It seems like all these unlicenced boats have come from out of the blue, maybe they have been moved off other moorings and have converged on this section of the GU. Whatever the case it needs sorting out and soon. We both love the GU and it wide variety of scenery and boats. 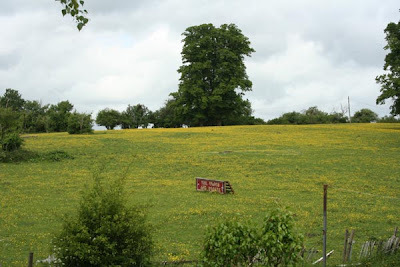 This meadow at Cassio Bridge lock with its buttercups, would certainly brighten the dullest of days. 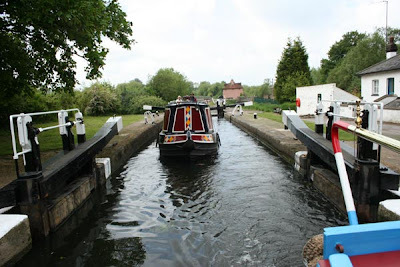 By the time we reached North Grove Lock we had caught Frank and Sue up on NB Lotus, who had stopped off along the way to take on a gas bottle, they were sharing the locks with NB Vancy. Having enjoyed a pleasant days cruising we decided to stop two locks later on Langley Wides. Once moored up Paddy and Marmite were allowed out to enjoy the afternoon sunshine. Today has been such a contrast to the weekend weather when it was wet at times, windy most of the time and chilly all of the time. 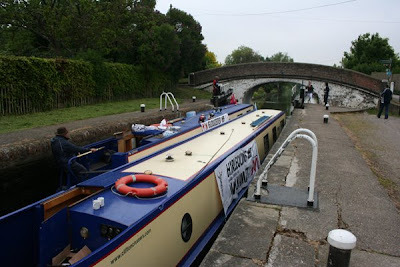 Our Ricky weekend began on Friday 15th May, when we left Black Jack's Lock mooring and cruised to Rickmansworth with NB Sweet Dreams owned by Jenny and Dave, who were also going to the festival. Having enjoyed a short jaunt up the canal, we arrived at Rickmansworth, where we were told we were mooring up against Joe and iron Joey boat built in 1883. Joe is still working today. For the Ricky weekend she was home to Peter Boyce and Irene, who were using Joe to sell items to raise money for the restoration of NB Lucy. 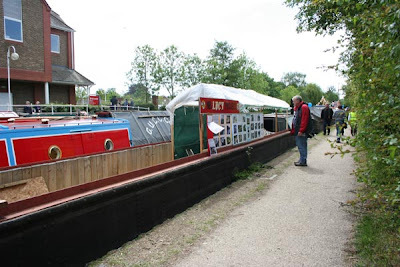 LUCY is a wooden butty built at Braunston for the carrying fleet of John Knill, entering the fleet in 1953. Peter and his team have now taken her out of her watery grave, with the view to restoring her, for further information go to her website. Once we were moored up alongside Joe. Frank and Sue on NB Lotus came alongside us, making us the jam in the narrowboat sandwich. The weather for the weekend was not supposed to be good, but Saturday turned out to be a great day, although the wind was very gusty. We both dressed up in our traditional boat gear and got to chat to lots of people, which included a visit from Frances and Alan who own NB Lazydays. They were up for the day to enjoy the festival and all it had to offer. Apart from the boats, there was also music, food and stalls. Being our first time at the event, we had a thoroughly great first day. Meeting lots of new people. There were plenty of historic boats to look at, these included. Working boats, Roger, Raymond, Nutfield, Corona, Baldock, Clover, Fazeley, Ara, Archimedes, Lupin, Victoria, Pacific, Caldy, Calysto, Nuneaton, plus others which fail to come to mind at the moment. I guess I am tired. One of the main events of the weekend was the tug of war. Chris Bennett had tried to talk Keith into entering Hadar, but there is no way we would want to risk anything happening to our National DA2. The tug of war was great fun, with NB Clover winning on Saturday and NB Kestral winning Sunday. We enjoyed visits from friends all over the weekend, but one of the highlights of my day on Saturday was meeting Sarah from NB Warrior. I have been wanting to meet Sarah for a long time, as I pop in and out of her blog, so it was great to meet her and Jim. We welcomed them onboard to have a look at our National engine and I gave her a guided tour around a not very tidy Hadar. For some reason when we are at festivals, the only areas that get tidied up are the back cabin and engine room. Paddy and Marmite made Sarah feel very welcome in their own ways. I sincerely hope that we meet up with them again, maybe when they are out on NB Warrior. We were fortunate with the weather on Saturday, unfortunately Sunday was not so great, so I ditched my boat womans bonnet and shawl for cords and a waistcoat. It began raining early on making the ground a little muddy, this was soon remedied with bales of straw around the arena. Despite the weather, the public were still out in numbers, enjoying the boats, music and the stalls. 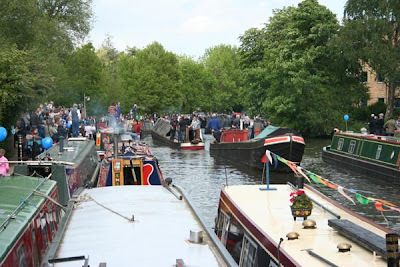 If you have never been to the Rickmansworth Festival, it is a must for any boater or member of the public. 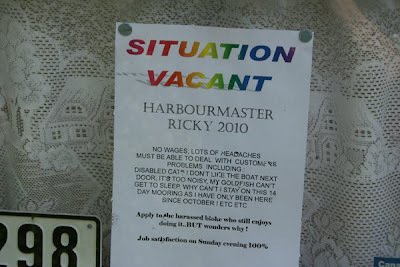 So another festival is over with for another year and the Rickmansworth Festival is in need of a Harbourmaster for 2010. When I asked the harbourmaster about his notice, he told me that it was all true what he wrote. Sounds like a great job to me LOL. Honestly it is hard work, but also rewarding when everything is going well. I think the stress levels maybe go up when things are not going according to plan though. Yesterday evening having eaten dinner, we were enjoying a cup of coffee, when my mobile phone rang, which was somewhat of a surprise, because it rarely rings. On the other end the voice asked "Where are you. Are you at Ricky yet". My reply was "No, who is this". His reply was "It's Tom on the Archimedes and Ara. Where are you then?". I told Tom that we were above Black Jack's Lock, so he said he would be coming our way in a short while, as he was taking on a delivery of diesel. 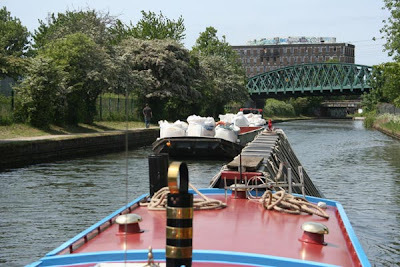 An hour later, I happened to look out of the back cabin doors and saw two large bows coming up the canal, so grabbed my windlass and went off down to the lock to set it for Tom. Keith and I helped Tom up through the lock. It was then I enquired if he would like a cup of tea. As he is not one to refuse an offer of either tea or food, he moored up alongside us. We supplied the tea and he supplied the biscuits. Now I do not want to make Tom blush, but he really is the nicest young man, who loves the job he does on Archimedes and Ara. Tom took over the boats and the diesel and coal business from Barney Richardson last year and has made the route his own. Tom sells diesel, coal and gas on the Southern Grand Union Canal and London. He also has Elsan Blue, logs, firelighters and kindling onboard, so he can cater to your every need should you be in his area. We both love chatting to Tom, because it is so refreshing to chat to a member of the younger generation who knows what he wants to do with his life. So many of the youngsters these days get a bad name, because of a few bad eggs who are involved in illegal things. Tom is living proof that not all young people are living life on the wrong side of the tracks. 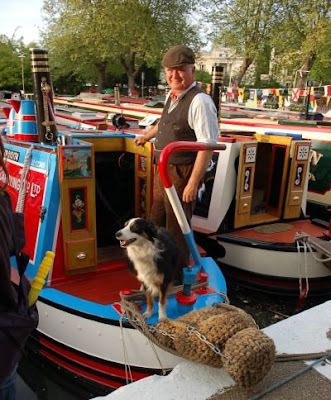 He has a great knowledge of the boats and the people on the canal, it is a pleasure to know him. Tom runs the coal boats on his own and gets his coal supplies from the family business W.G Hill and Son, Twyford, Buckinghamshire. It really is a family run business, with each member of the family, having a part to play in the business. When Tom is not on the boats he is in the yard filling coal bags. We spent a good couple of hours chatting about everything to do with boats and boating, before Tom needed to move as he had a customer to supply with diesel before it got totally dark. he was then going to moor up at The Coy Carp overnight ready for his diesel delivery this morning. We will see Tom and the boats again at the Rickmansworth Festival. We were having a nice quiet day, surfing the internet and playing games, when we heard a strimmer battering the side of the boat, followed closely by a mower. The towpath grass was being cut and that meant the side of the boat would be plastered in grass. There was nothing for it, but to turn the computer off and get outside and wash the boat down. 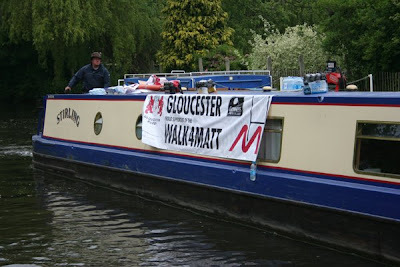 No sooner had we set foot out of the boat, we saw a procession of boats coming down towards Black Jack's Lock, all carrying banners of the 12 premiership rugby clubs. The 12 boats and their crew of over 100 people are taking part in the Walk4Matt09. They are helping to raise money for Matt Hampson, who is paralysed from the neck down. Matt Hampson played for Leicester and England Under-21 before being paralysed in a scrummage in training in March 2005. The walk began in Rugby. And will end in Richmond-on-Thames on midday Friday 15th May 2009, the day before the Guinness Premiership Final at Twickenham. If you see them please support them as it is for a good cause. I got chatting to one of the designated skippers, who told me that all of the boats skippers had to take a course to steer the boats, because none of them had done it before. They were all having a wonderful but tiring time. Even the walkers were still smiling. At the end of each day they look forward to an evening in a pub near to the canal. I promised them I would give them a mention and I sincerely hope they continue to enjoy the walk. The walk has the backing of British Waterways, PRL (Professional Rugby Limited), PRA (The Professional Rugby Players Association) and all 12 Guinness Premiership Rugby Union Clubs, Leicester, Northampton, Bath, Worcester, Gloucester, Bristol, Newcastle, Sale, Harlequins, Wasps, Saracens and London Irish. Good luck to them all on their final leg. Labels: The Matt Hampson Walk. 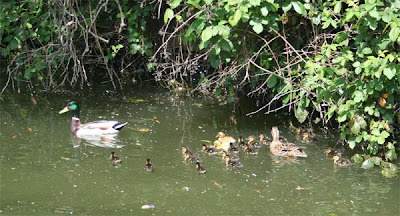 Can anyone beat this family with 20 ducklings? We are not sure if the two fluffy yellow ones are adopted LOL. But they certainly have the cute factor. Slough Arm to above Black Jack's Lock, Harefield, 5.8 miles and 5 locks. Our morning began with the usual, dog walking, eating breakfast, oh and not forgetting to get dressed, that comes before the dog walking. 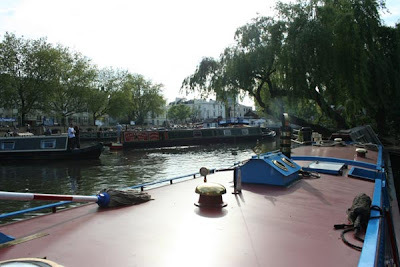 Once we were all ship shape, we left our overnight mooring, which was lovely and quiet this time and headed back on to the Grand Union main line. Our first port of call was the sanitary station at the Packet Boat Marina, where we took on water and got rid of rubbish. Whilst filling up with water, we stood and watched as another boater struggled with the £12 pump out, which did not seem to be working correctly. In the hour it took us to fill up with water, it took him as long to pump out his toilet waste. It made us feel so grateful that we do not have a pump out. We left the sanitary station and headed towards Cowley Lock, where one of the Land and Water gravel boats was already beginning its descent. I walked up to help with the lock gates and got chatting to the local police office who was on towpath duty for the day. We had an interesting conversation about the little darlings who tear up the towpaths on motorcycles. Before carrying on with the conversation. I had to help the gravel boat get out of the lock, by opening a paddle to allow water to surge under the boat, enabling the operater to move out of the lock. The gravel boat was at its heaviest with 160 tonne onboard, so every little bit of help was appreciated. With Hadar now in the lock and the paddles raised, Keith and I carried on the conversation with the policeman about the towpath tearaways. The policeman wanted to know if we had encountered any problems with kids on motorcyles, which of course we had. His advice to us was to write down as much detail as we could about the bikes, riders etc and let the police know. I told him I can go one better, we always take photographs, which pleased him no end. It seems that this coming weekend, there is going to be a huge crackdown on the towpath tearaways. They have already caught a few of them and crushed their bikes, but they are not letting up on the crackdown, which is excellent news for anyone else who likes to walk the towpath, because they maybe able to walk them in safety in future. ( I know I am dreaming ). 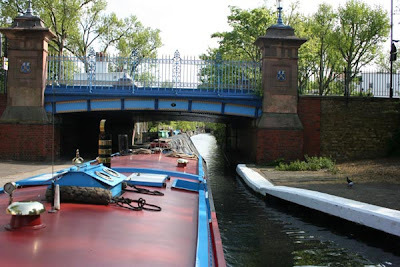 Having wished the policeman well, we carried on our merry way, coming across NB Chiswick at Uxbridge, still decked out in her bunting from the Little Venice Cavalcade. Maybe she is heading for the Ricky festival as well. Before approaching Denham Deep lock, we spotted this boat with its four occupants and one that had abandoned ship into what seemed like the life raft, it just looked like they were all about to jump ship. They greeted us with lots of barking and waggy tails. Which made us both smile, as it was such a cute picture. By the time we reached Denham Deep lock we had been caught up by a Wyvern Shipping Hire Boat, with balloons and bunting on the roof. Having emptied the lock, we shared the lock and the following two locks on our way to Harefield. One of the ladies onboard had been asked, by her husband how she would like to celebrate her 60th birthday, and she told him that she wanted to celebrate it on a boat in London. So they hired a boat with friends and were enjoying a fantastic time. 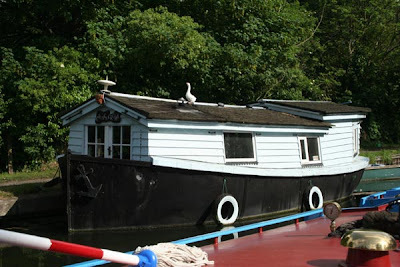 Our time together ended when we exited Black Jack's lock, and moored up on the towpath. It was now time for some lunch. we said our goodbye's and wished them well with the rest of their holiday. After lunch we walked up to see Keith's sister and brother-in-law, where we had a much needed cup of tea, as it is some hike up the hill, but wonderful coming back down to the boat later in the afternoon. We are stopping put for a couple of days, as we do not need to be at Rickmansworth until Friday. The weather today, gave us sunny spells, but once again the wind was a nuisance at times. Still we cannot have everything I guess. Black Jack's Mill, is looking splendid now that it has been given some TLC. It has been turned into a Bed and Breakfast. The mill itself was built in 1840 and is a former watermill. It made an appearance in the film The Bargee. Little Venice to the Slough Arm. 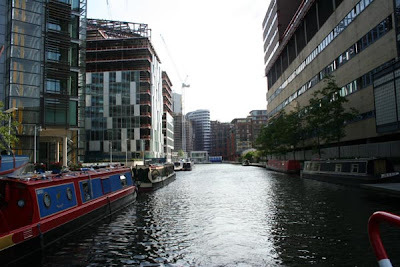 We left Paddington Basin at 9.40am, after a very pleasant stay. 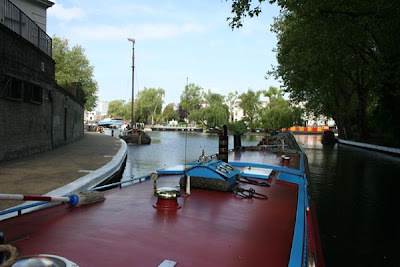 We entered Little Venice Pool from the Basin and turned right. 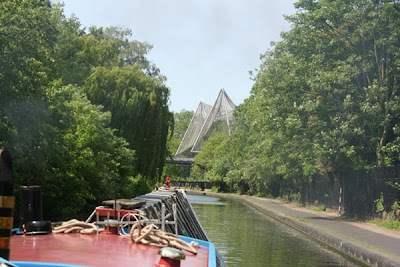 We then cruised up towards Maida Hill Tunnel, destination Camden Market. 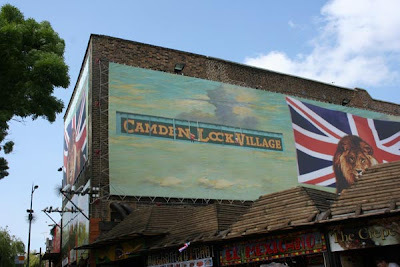 It was the first time Keith and I had been to Camden Market. We arrived to a very quiet market. Some of the stall holders were still opening up. It wasn't awake properly, so we had the place pretty much to ourselves, which was nice, as neither of us are into large crowds. The Canal Market re-opened on Saturday, after it was destroyed by fire in February 2008. 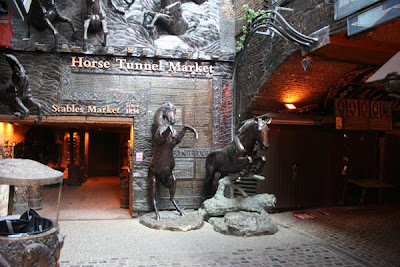 The Horse Tunnel Market is really spectacular, with it large horse statues. The Stables were built in the 19th Century for horses and pit ponies that were used to shunt railway wagons. Today the stables are used as stalls for the market traders, it is all very impressive. Although we found the market interesting, there was very little in the way of things there that we would buy. As neither of us is into Leather and Goth clothing. What you cannot help but notice, is that many of the stalls have the same things. The food hall of the market did get our mouths watering from the fantstic smells permeating through out the market. If it had been lunch time, we may have tried some of what was on offer. With the visit over we headed back to Hadar, which was on the stop and shop moorings, which allows you 4 hours stopping time. Whilst Keith got us underway, I made us a coffee. The weather had been very kind to us all day, with warm sunshine. The only downside was the breeze, which was gusty at times. 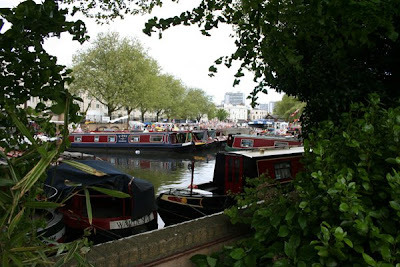 We head back past London Zoo and back into the Little Venice Pool, where we stopped to empty the toilet cassettes. We have really enjoyed our visit to London once again and will be back again in the future, to carry on to do the Thames again. We saw only a couple of other boats moving today, one of them was a lighter being pushed by a tug. I was a little surprized to see it so quite. We stopped at Alperton to do a food shop at Sainsburys, because our cupboards and fridge were looking rather sad. The one thing we have found on this stretch of the Grand Union is the lack of decent deep moorings. 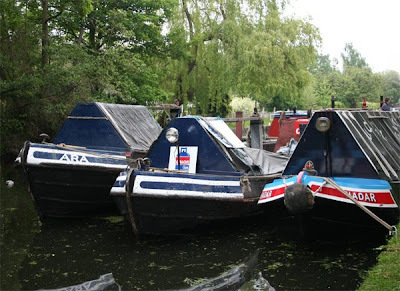 We had hoped to moor at Greenford, near the Black Horse pub, but once again the moorings were taken up by boats that had been there when we went down to Little Venice more than a couple of weeks ago, so they are now officially continual moorers. So we ploughed onwards until 6pm, when we decided to stop on the Slough Arm over night. It has been a long day and we are both shattered now. I do not think either of us will have any problem sleeping tonight. 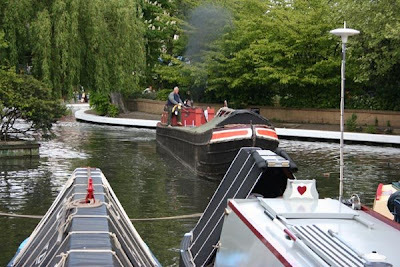 With the Little Venice Cavalcade over for another year and with little to do until we head for the Rickmansworth Boat Festival, we took the opportunity to join the masses on the tourist trail. Yesterday Keith went off to a BT works reunion, where he met up with fellow workers he worked with 27 years ago in London. The one thing about reunions is you meet up with people you had totally lost contact with over the years. A good time was had by all from what Keith said. I was home alone in the afternoon, so took myself off to investigate Edgeware Road and all it had to offer, making sure I knew how to get back to the boat, as I am not that great with directions and can get myself lost easily. The Edgeware Road has a variety of shops, large and small. They supply all nationalities who reside in the area. It was busy as the market was taking place, so after a walk around I headed back to the boat, and the jobs I had left behind when I went out. Keith is still getting over another virus he picked up since receivering from the one he picked up before we went into dry dock at Uxbridge on the 11th April. He still has a nasty cough, but he assures me that he feels fine. So with his assurance we decided to head into the West End to go and see Harrods. I have seen it plenty of times on the TV, and always wanted to have a look inside. 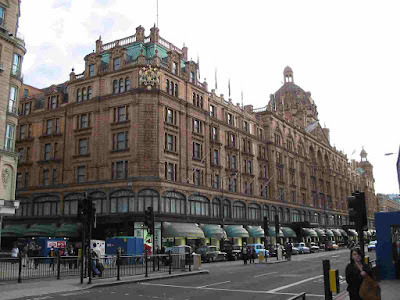 As Keith had never stepped inside the store either, we joined the throngs of tourists and took the tube from Paddington into the West End and arrived outside of the Harrods store. It really is an immensely grand place, which is just as impressive on the inside. I did find it really rather too posh for my liking and some of the prices of things was quite shocking, but I suppose if you have that sort of money then you can buy anything. For one pair of Jeans they were asking £297. If you bought three pairs you got the third pair at half price hahahaha now that is good of them. After having had a quick peek into another persons life style, which was definitely not for us we left and headed for Covent Garden, with its street entertainers and market stalls, which was much more our scene. 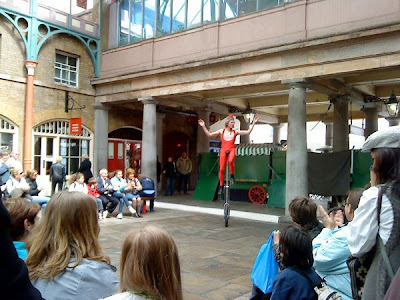 The gentleman in the photograph (above), was catching a cup, saucer and spoon on his head after balancing them on his foot. It was really entertaining and he was brilliant at drawing the crowd in. We had thought we may go to the London Transport Museum, but with it being £10 for each adult, we soon changed our minds. Sarah Siddons, the oldest working main line electric locomotive in Britain, which is housed in the museum, will make special trips between Harrow-on-the-Hill, via Rickmansworth to Amersham on Sunday 17 May as part of the Rickmansworth Festival, so we look forward to seeing her there. Before lunch we walked around Somerset House. You cannot help but be amazed at the architecture, it really is quite stunning as are all the old buildings in London. 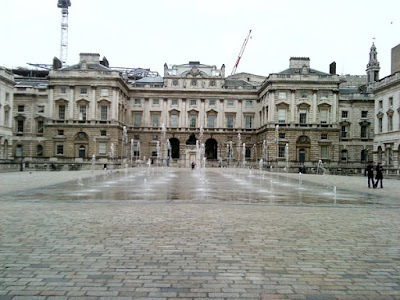 In the courtyard they have 55 fountains which in the summer dance and in the winter you can skate on the ice rink. Although I find London an exciting and vibrant city, as a country girl born and breed, I do find the crowds of people overpowering, and if it were not for me holding Keith's hand most of the time, I would surely have got lost. Thankfully Keith knows London well, from his days working in the capital, so I just followed as he led the way. We stopped for lunch at the Thai Square Restaurant, where we enjoyed a fabulous lunch. With lunch over, we once more joined the crowds and headed for Chinatown, which dates back to the 17th Century and beyond. It has plenty of places to eat and drink, not to mention the Chinese Supermarkets, where you can buy your very own genuine Chinese produce. 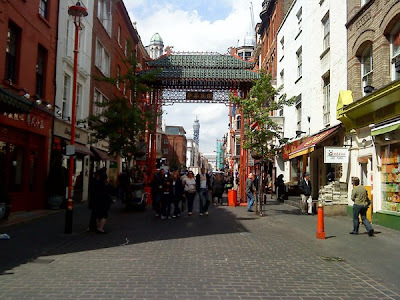 If you are coming to London you really must visit Chinatown, and soak up the atmosphere of a place steeped in history. We also walked around Leicester Square with its cinema's and theatres. We have promised ourselves that one day we will go and see something at one of the many theatres. At the moment there is so much to see. Having enjoyed our jaunt out, it was time to head back on to the tube at Leicester Square and get off at Paddington Station. The tube was packed today, due to work being carried out on the Circle and Jubilee lines. At times we felt like sardines in a tin. Keith assured me it is far worse on a week day at rush hour. So back onboard Hadar, we have settled in for the rest of the day. I sat watching a film, whilst Keith took a nap. It has been a wonderful day. 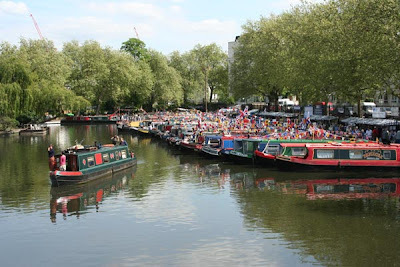 As we are sitting in Paddington Basin I thought I would do a trawl through my favourite blogs and I saw that Andrew on Granny Buttons did a write up about Reuters, who did a piece on the Little Venice Cavalcade, which quoted us in their write up. Thanks Andrew for drawing my attention to the write up. Whilst at the Cavalcade, Keith and I must have chatted to hundreds of people over the three day's, including Rebekah Curtis from Reuters who has written a piece about the Canalway Cavalcade. 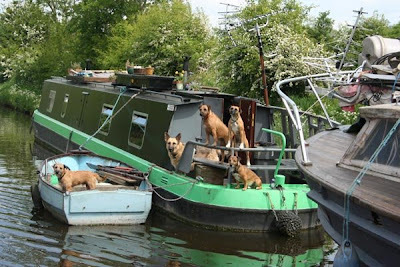 London's canal boat dwellers live in city oasis. The piece she has written whilst giving good publicity for the event, has misquoted us a little. 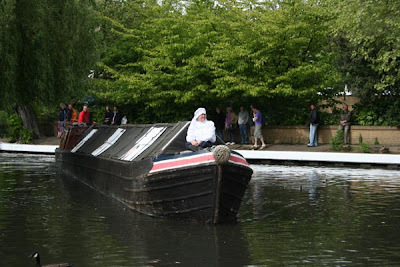 Firstly Rebekah writes ""We're continual cruisers, we keep moving 24/7," said 47-year-old Jo Lodge, who travels all year round with her husband Keith selling coal from their boat to the canal community in Leicester". We are Continual Cruisers, who sell coal from our working boat, but we have not yet begun our coal run on the Leicester. 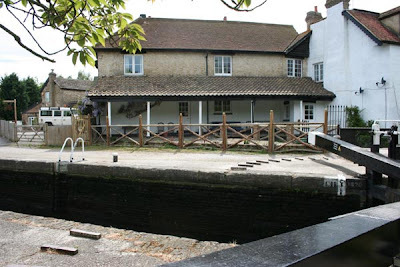 That begins in October, having been given permission by British Waterways to trade on this section of the Grand Union. Rebekah then writes "Her husband Keith is one of many boat-dwellers whose family has worked on boats for generations, and is deeply rooted in the floating community in which some boaters were even born aboard". This is not correct. Keith worked on Pisces for a few years in the late 60's, his family did not work on the boats. The only family member he knows of who worked on the boats was his Grandfather who was a lighterman on the Thames, so unfortunately Rebekah did not quite get the facts right. It is hardly surprising when you consider how hectic it was on the Saturday when she spoke to Keith and I. Rebekah then rang me up a couple of days later asking me a question about something she had written in her note book, because she was unable to read her own writing LOL. It may have been a good idea if she had run this piece past us first before publishing it. I told her, she should have been a doctor if she has writing that she cannot read, which made her laugh. I do wish that the press would get their facts correct before going to print, as there is nothing worse than being mis-quoted. Since posting, I contacted Rebekah via e-mail. Rebekah has replied promptly apologising profusely for the misunderstanding, which we have accepted. We wish Rebekah well with her reporting career. For anyone going to a canal festival, they only ever see the glamourous side with the festivities running like clockwork, but for those who help to set the festivals up all over the country, they know how hard it is to actually get things up and running. It is not a matter of just putting up a few stalls, organising the boats and the music. The organising for each event takes months to sort out. Not only do they have to organise the site, they have to talk to lots of different departments, which include the Health and Safety and Enviromental Health departments. This past week Keith and I have learnt a lot about how much effort is put into organishing an event this big. Today we also learnt how difficult it is to pack it all away. There is a lot of waiting around to be done as well, such as waiting for the trucks to come and take the porta loos away and the fencing people. It is not an easy job, but we have had the most wonderful time. Today it all began early with us joining the other volunteers from the Waterways Recovery Group. They had already taken down the stalls, the banners had to come down, as did the marques for the beer tent and food stalls. The beer tent by the way sold out completely of beer and cider. I helped to pick up litter, as the area has to be all neat and tidy, which would be checked by the local council. When the porta loos firm turned up, I donned a high visability coat and offered to stand in the road, whilst the company pumped out the porta loos, (Oh the glamour of it all). They then took the loos away. Standing in the middle of a busy road is not to be done by the faint hearted. One four wheel car driver, came around the sharp bend and got very close whilst talking on his mobile phone (Shame on him). Our long day ended with a fish and chip supper and a couple of glasses of wine with the group to wind down after a long and busy day. 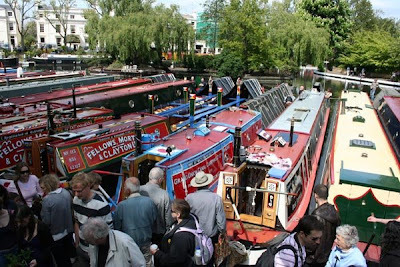 Keith and I have met a wonderful bunch of people, which included Karen and Gary on NB Fox, Dave and Maria on NB Daisybob, Bob on NB Glenfield, Sarah, Sammy, Mike, Christine and the other volunteers who made it a excellent weekend for us and everyone, who visited the Little Venice Cavalcade. having seen it from both sides, I would say that the next time you go to one of these events with your boat or on foot and complain about something, just spare a thought for those who have worked hard behind the scenes to put the event on. Bare in mind that they do it completely unpaid and why not actually volunteer your services, even if it is just for one day. You will certainly see the less glamourous side. If any from the Waterways Recovery Group is reading this. Thank you so much for making us feel very welcome and for all your hard work. See you another year we hope. 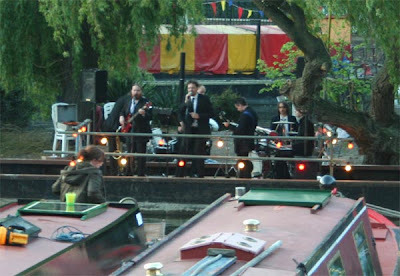 Yesterday evening, Keith and I gathered up a couple of cushions, a bottle of wine and glasses and sat on the bow of Hadar to enjoy the sounds of "The Rhythm and Blues Brothers", who came to last year's Little Venice Cavalcade and were absolutely brilliant. They did not disappoint last night either, if you are a Blues Brothers fan. We sat out listening to them until 11pm and then were invited on to Paul and Eileen's boat "Destiny 2" for a coffee. The chatting went on until we realised it was 12.45am. Surprisingly none of us were that tired, we were just enjoying each others company and the chatter, which was not all about all things boating, which made a nice change. This morning (Bank Holiday Monday) started well with some sunshine, but it soon clouded over and rain began to fall, which did not bode well for the rest of the day. Thankfully the rain was intermittent and did not stop the public coming out and enjoying the final day of the Cavalcade. Keith and I were summoned to the Horse Bridge for 1pm in our traditional outfits. So we duly obliged and went to the bridge, where we were announced as the winners of the Vic Trott Trophy for best dressed boat people. We are now the proud owners of the Vic Trott Trophy, which we will be looking after for a year and a bottle of white white. It was quite an honour to win something as neither Keith or I are ever that lucky normally and it was not as if we knew we had been entered into this competition. As the day wore on the few drops of rain kept subsiding and things would warm up a little, but the sun never put in an appearance all day. Events at the cavalcade carried on regardless and later in the day the Historic Boats paraded in the pool. 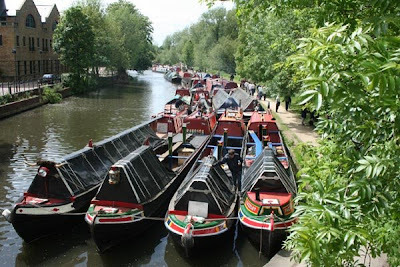 These included the Narrow Boat Trust Boat Nuneaton, Victoria, Indus and Pictor, Fulbourne and Angel, Ara and Archimedes, Gerald No13, Bantam, Chiswick and Gemini. It was wonderful to see so many Historic Working Boats in one parade. Sadly other Historic Working Boats had left early due to other commitments. With the event announced closed at 5pm, it really felt like an anti-climax some how after all the hustle and bustle of the past couple of days. As people left the event on their boats, others came in from the visitor moorings to take their place, helping to swell the numbers in the pool. 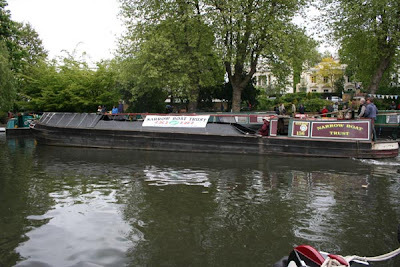 So that has been the Little Venice Cavalcade 2009. It has been an excellent event and everyone has worked so hard. We look forward to coming to the event again over the years to come. Tomorrow we will help with the hard work to take all the banners and stalls down, someone has to be prepared to stay behind. 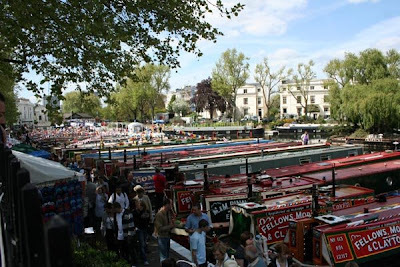 It has been another manic day at the Little Venice Cavalcade. Unlike the hot day we had yesterday, today has been chilly and cloudy at times, but still the place was packed with people. Yesterday the bar ran out of beer and cider, so that is how good yesterday was LOL. We enjoyed another day of chatting to people and having our photographs taken. Yesterday evening Keith and Paddy had their photographs taken and it is now on the front page of the canal section of The Thames Guide. Paddy can never resist having his photograph taken. I think I was cooking dinner at the time. We had an expected visit today from Maggie, Mark and family from NB Forever Young. We met Maggie and family at Shackerstone last year. Maggie if you are reading this, we hope you enjoyed your day and it was lovely to see you all again. Happy cruising this year. Today has been the boat handling competition, which has been fun to watch in the wind. 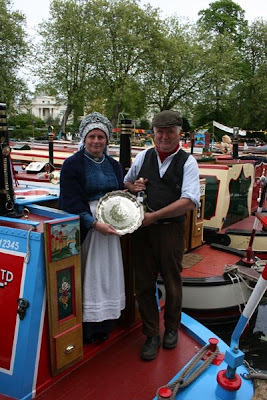 Historic working narrowboats Nuneaton and Victoria took part, as did Fulbourne with Elaine sat proudly on the bow. Passing through we saw Historic narrowboat Tarpoley. Yesterday we met one of their volunteers Penny. 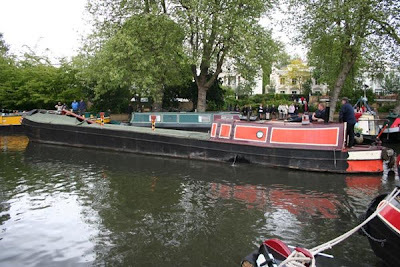 Also passing through were the Historic working narrowboats Indus and Pictor now owned by Liz and Dan. It is fabulous to see so many working boats in one place. 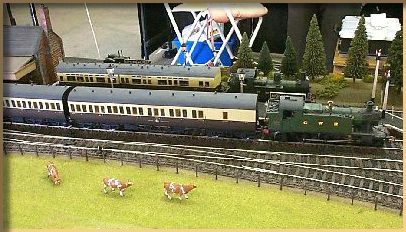 Tomorrow is the final day of the Cavalcade, so we are hoping the weather will be kind to us. If you have nothing to do tomorrow, why not come down to the Cavalcade, it is a fantastic event for anyone, whether you have a boat or not. Wow what a hectic few days, what with helping to set up the Cavalcade site and then the moving into the pool it has been manic. I really do not think people realise just how much hard work goes into setting up a site for a Cavalcade or Festival takes. We spent the morning helping to build the railings on the pontoon, which goes up against the island in the pool, we then went out on to the island to do some tidying. When I say tidying I mean loping branches off of the willow. We left the loping to Bob, Keith helped to gather the cut of branches whilst I and the others stacked it on the island. We always had in mind not to disturb the nesting Canada Geese and the pair of Swans to much, who were both on eggs. After that it was time for lunch in the works compound and a nice cup of coffee. Dave who is in charge of the work group works wonders in getting everyone to where he wants them, but for us that changed yesterday (Friday) when we were called to move out boat from out of the Paddington Arm and into the Pool for the festival. We were being put in ST42, which gave us a great view of the island, so we would be in the front row for the Blues Brothers music on Sunday evening. The moving around of the boats to get them into the pool takes some organising, and it did not help our cause when we got a pile of rubbish around the prop arghhhhhh. So we turned Hadar around and went back into the Paddington Arm, cleared the prop and tried again to moor her stern in against the bank, this time making it alongside NB Destiny No2 owned by Paul and Eileen Garner. Later in the day we were joined by the Pinnocks four boat on the otherside of us. Working Butty Fazeley being moored alongside us. Micheal has done a fantastic job restoring her and she looks a treat with his motor Clover. After finally getting moored up, I then washed the boat down and cleaned the brass, because we had been covered in sap from the trees. it had been a long day and we were bothy ready for our bed by 10.30am, knowing full well that Saturday was going to be a challenging day. We were up early. Paddy was walked, all the last minute cleaning of the brass was done, and Keith and I dressed for the part, he in his usual boatmans gear and me in my boatwoman's bonnet, blouse, skirt and shawl. The morning was extremely manic with losts of people wanting to take our photo and ask us questions about the boat and its history. We had the local papers asking for interviews and photos, as well as a young reporter from Reuters, who interviewed us. Before lunch LadyBanana paid us a visit with her partner Robert. it was so wonderful to put a face to the name, having followed her blog for such a longtime. So LadyB if your reading this. Thank you for taking the time to come and see us, it was lovely to meet you both and show you around our home. Adam from NB Debdale came and said hellow as well with Simon from NB Tortoise. We have had the most wonderful first day of the Cavalcade, meeting old friends and lots of new people. The funniest thing that happened today to us was at lunch time. I made us some sandwiches and bought them out a long with a Victoria Sandwich, which I made earlier in the morning and put them on the drop down table in the back cabin along with a cup of coffee. Keith and I sat down to lunch and then we discovered that people still wanted to take our photographs, so much so that they were down on their hands and knees taking our photographs whilst we ate lunch. I turned to Keith laughing and told him that I now knew how a monkey in a zoo felt LOL. it really was quite strange. The whole day has been a huge success, so much so that the beer tent ran out of beer and cider at one point, which has never happened before on a Saturday. It has been the busiest Saturday for years so we have been told. Lets hope the next two days are just as good.